Scientist, diplomat, and spy, Aaron Aaronsohn was one of the most extraordinary figures in the early struggle to create a homeland for the Jews. Born to Jewish settlers in Palestine, he ran a spy network that enabled the British to capture Jerusalem during World War I and made him the rival of his contemporary, T. E. Lawrenceâ€”who may also have been his flamboyant sister Sarahâ€™s lover. 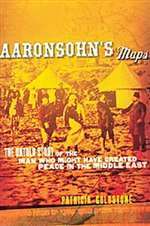 A rugged adventurer, Aaronsohn became convinced during his explorations of the Middle East that water would govern the regionâ€™s fate. He compiled both the areaâ€™s first detailed water maps and a plan for Palestineâ€™s national borders that predicted andâ€”in its insistence on partnership between Arabs and Jewsâ€”might have prevented the decades of conflict to come.